For Lisa Tumahai, whānau is and will always be paramount in her life. She is a direct descendant of Te Riaki and Teoti Tauwhare of Arahura, and is daughter of Tahana and Gay Tauwhare. She is married to Francois Tumahai, and they are the passionately proud mum and dad of Chantal, Dane and Tamara. Home has always been Te Tai Poutini for Lisa. She still remembers the first time she heard the legend of Poutini, the taniwha who captured the beautiful Waitaiki, fleeing with her to the West Coast of Te Waipounamu and transforming her into pounamu in the riverbeds of the Arahura River. Like generations of Ngāi Tahu before her, Lisa treasures the taonga created by Poutini, and recognises its unique ability to connect us to the whenua of Te Waipounamu, and act as a touchstone for our whānau. Through the Pounamu Vesting Act and the creation of the Ngāi Tahu Pounamu brand, Ngāti Waewae and the kaitiaki rūnanga have reclaimed their rightful role as guardians of the precious stone. Lisa is passionate about ensuring all Ngāi Tahu thrive and in supporting regional development opportunities and initiatives that enhance the wellbeing of Ngāti Waewae whānau. The Tai Poutini region has always been important to Ngāi Tahu as a major trading route in Aotearoa, and today its foot print is firmly imprinted upon the landscape. Through tourism operations, partnerships and investments the iwi is an important contributor to the West Coast community. 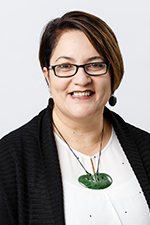 Pounamu is a gift best given – it is believed to bring good fortune and good health which is why Lisa endorses the gifting of a pounamu taonga to all Ngāi Tahu pēpi.